The 2014 San Francisco Chronicle Wine Competition results are in, and we scored BIG! This year showed a record number of 5,825 entries from over 1,500 wineries across the United States - the largest competition of American wines in the world! Needless to say we were pretty amazed with our results and couldn't wait to share. By scoring Gold and above, we're eligible to pour at the pubilc tasting in San Francisco on February 15th. We hope to see you there! 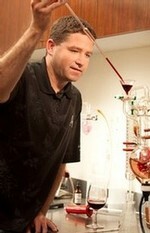 Ever wonder what goes on inside a winemaker's head (besides winemaking stuff of course)? Well wonder no more! Our winemaker, Mark McKenna, has started his own personal blog called Life Among The Vines. Get more personal insight into Mark's winemaking philosophy, his awesome personality and even random thoughts from time to time. Then you'll see what really goes on inside that crazy mind of his. Wait, did I say crazy? I meant BRILLIANT!